Thailand's capital and largest city is Bangkok. 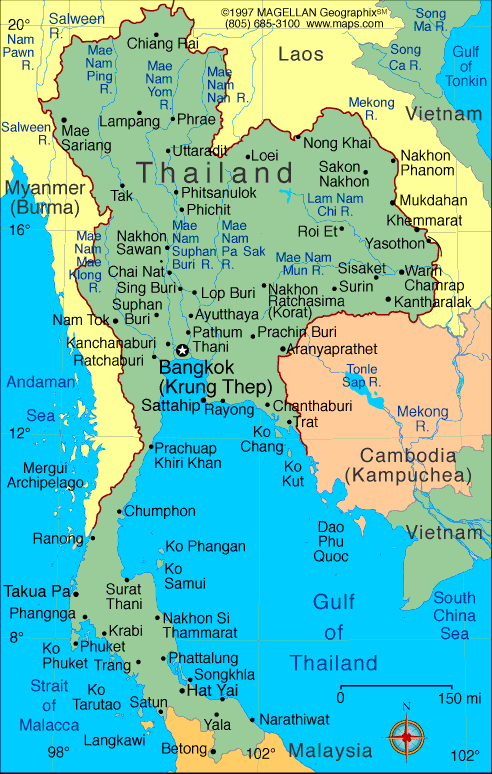 Below is a link to a really nice detailed Map of the kingdom of Thailand. When you click on the link it will open in a new window. Thailand also called the "land of smiles" but the real translation of the name Thailand would be "Country Of Liberty' or "Land Of The Free". Thailand is the only country in South East Asia which has never been colonized by a western colonial power. A Map can not display the beauty of Thailand but only show its borders. One of the most fascinating and mystical feature of Thailand is its culture and its deep roots in its religion, Buddhism. It reaches from the Golden triangle in the north with its beautiful mountains where Thailand Borders Laos and Burma ( Myanmar) to the South where Thailand borders Malaysia. In the south of Thailand one can find some of the most beautiful beaches and islands in the world. White sandy palm-lined beaches from the island of Phuket to Koh Samui. Here is a detailed map of Pattaya. Jomtien Bay, Naklua Bay and Pattaya Bay. I like this Map because it is so detailed. It shows locations of hotels, banks, businesses, travel agent, hospitals, fire station, shopping malls etc. In fact you can get a bigger version of this map of Pattaya too. Remember this page and website. When you come to Pattaya you know where to go to find a Pattaya Map and a lot of more information about Pattaya. Feel free to look around.